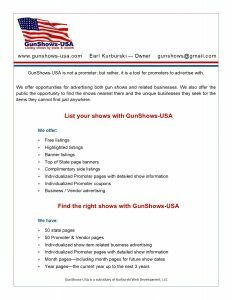 GunShows-USA is not a promoter, it is a listing site. GunShows-USA does not hold events, it lists them. Please direct all vending questions to the promoters in your state. You will find promoters’ contact information listed along with their event advertisements; these can be found on every state page of this website. Please view our Descriptions & Pricing page BEFORE submitting show listings or requesting banner advertisements. For show listing submissions, please use the submission form located at the bottom of the Descriptions & Pricing page. 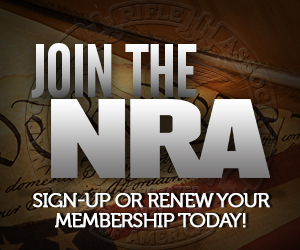 GunShows-USA does not provide mailing lists, we are an online service only. All shows and information can be accessed via our website at all times. We are not a promoter, we are a listing site for promoters to utilize. Please contact the promoters for information not specified on our website. If you are traveling long distances please be sure to verify the show with the promoter first.